A congenital dermal sinus is a scaly, multi-layered channel of tissue found along the body’s midline anywhere between the nasal bridge and the tailbone. The tract may end just below the skin surface or may extend to portions of the spinal cord, skull base or nasal cavity. A spinal dermal sinus may appear as a dimple or a sinus (open tract), with or without hairs, usually very close to the midline, with an opening of only 1 to 2 millimeters. The surrounding skin may be normal, pigmented or distorted by an underlying mass. These tracts are a potential pathway for infections within the dura mater, the tough outer membrane covering the brain, and may result in meningitis and/or an abscess. The contents of the dermal sinus causing sterile (chemical) meningitis may also irritate the skin. If the tract expands into the thecal sac (the sac that contains the spinal cord) to form a cyst, the mass may appear as a tethered cord. In these circumstances bladder dysfunction usually occurs. If the tract is seen following birth, a magnetic resonance imaging (MRI) scan should be obtained. Images may show the tract and its point of attachment. 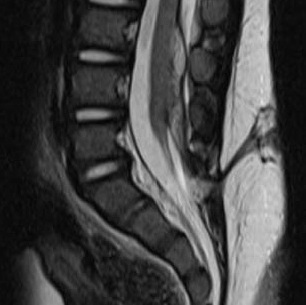 MRI also shows masses within the canal. Sinuses above the lumbosacral region should be surgically removed. Although approximately 25 percent of presumed sacral sinuses seen at birth will regress to a deep dimple on follow-up, all dermal sinuses should be surgically explored and treated prior to development of neurologic symptoms or signs of infection. The results of treatment following intradural infection are never as good as when undertaken prior to infection. Sinuses that terminate on the tip of the tailbone rarely penetrate the dura and may not need to be treated unless local infection occurs.